If you love shag dancing, the beach and hanging out at an oceanfront swimming pool, then you will love North Shore Villas. This North Myrtle Beach resort is located in the Ocean Drive section of North Myrtle Beach, South Carolina. It is high-rise North Myrtle Beach resort that is right on the oceanfront. Indulge in all that this North Myrtle Beach resort has to offer and have a North Myrtle Beach vacation of a lifetime. North Shore Villas is at 10th Avenue South, just a few blocks from the popular beach clubs where beach music and shag dancing come together on the wooden dance floors. This oceanfront North Myrtle Beach resort has a path that leads from the welcoming pool deck, through the dune line that is laden with sea oats and out to the white sandy beaches. North Shore Villas has it all. The sun deck spans the entire length of this North Myrtle Beach resort and chairs are everywhere so you can find one in an area of the pool deck that you like the most and then enjoy the sunshine while listening to the ocean’s waves. There is a parking garage at this North Myrtle Beach resort as North Shore Villas is built on top of several levels of parking. The North Myrtle Beach accommodations at this oceanfront retreat are spacious. Choose between a three- or a four-bedroom North Myrtle Beach vacation rental. Some of these North Myrtle Beach condominiums have three baths while others have four baths for your utmost convenience. 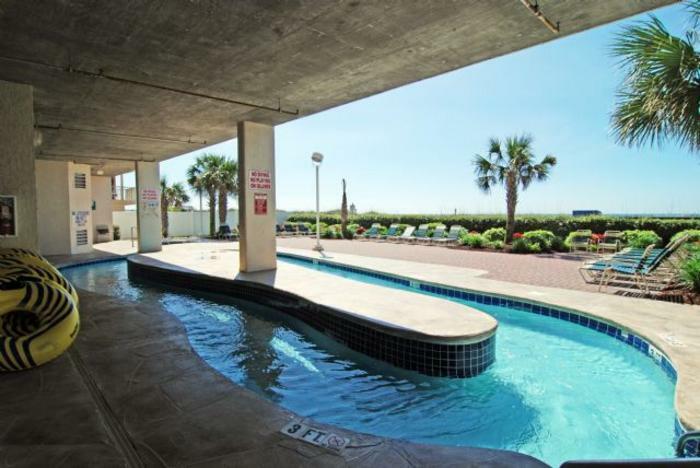 These spacious condos in North Myrtle Beach, South Carolina can sleep eight, 10 or even 13 people comfortably. All of these North Myrtle Beach rentals are non-smoking units. And all of these North Myrtle Beach condo rentals have an oceanfront balcony with incredible oceanfront views. The panoramic vistas from your private North Myrtle Beach condominium are jaw-dropping. You can full relax on the private oceanfront balcony in your condo in North Myrtle Beach, SC because the scene could not be more glorious. Breathe in the fresh air. Listen to the waves roll ashore. Watch for dolphins cruising past this North Myrtle Beach resort. The sun-filled balconies at the North Myrtle Beach vacation rentals at North Shore Villas are often the favorite meeting place during a North Myrtle Beach vacation. The North Myrtle Beach condo rentals at North Shore Villas all feature high-speed Internet access. Bring your laptop and get online during your North Myrtle Beach vacation. Take advantage of the Internet connection and look up restaurant menus and store hours before you leave the comfort of your North Shore Villas rental. Each of these condos in North Myrtle Beach, SC also has a washing machine and clothes dryer. Having these appliances at your fingertips can change so much about your North Myrtle Beach vacation. Don’t worry if your favorite outfit gets dirty. With laundry facilities in your North Myrtle Beach rental you can remedy the situation without having to leave this North Myrtle Beach resort. One of the best features of these North Myrtle Beach condo rentals is the kitchen. It is fully furnished with everything you might need to make a meal for your family during your North Myrtle Beach vacation here. Cookware, dishes and utensils are all provided for you in the kitchens of North Shore Villas. A dishwasher is even part of the kitchen so you can quickly clean up without having to do dishes by hand during your North Myrtle Beach vacation. Elliott Beach Rentals is not affiliated with onsite management or the HOA of North Shore Villas.